Gordon Setter is an old dog breed; black and tan setters were known in England and Scotland as early as the 1500s. In the early 1800s, the Duke of Gordon took a somewhat generic bird dog and created the versatile dog we know today. The Gordon Setter stands between 23 and 27 inches tall and weighs between 45 and 80 pounds. He has a chiseled head, long muzzle, dark eyes, and dropped ears. He is sturdy without being heavy. He has a long tail. 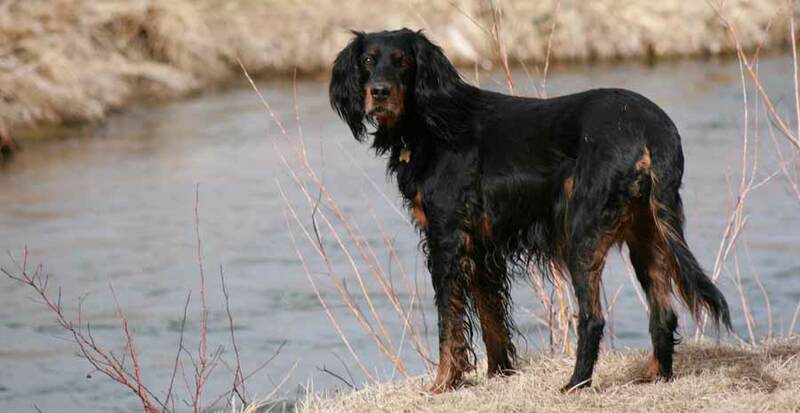 The Gordon Setter coat is straight or slightly wavy, with feathering on the tail, the back of the legs, the belly, the ears, and around the neck down to the front of the chest. The Gordon Setter’s lovely coat needs at least twice weekly combing and brushing to prevent tangles and mats. Gordon Setter puppies should be brushed daily to get them used to the grooming routine. The Gordon Setter is a busy dog breed who needs vigorous daily exercise. The Gordon Setter is an athlete and will enjoy playing flying disc, training in agility, tracking, search and rescue, playing flyball, or participating in field trials. Without enough exercise, Gordon Setters will get into trouble and can be quite inventive. All exercise should be on leash or within a fenced area; when hunting, a Gordon Setter can be gone in a flash. Although bright and curious, they can also be a bit stubborn. Gordon Setters are highly intelligent dogs, and basic obedience will make your dog a better companion. Firmness and consistency are the keys to handling Gordon Setters. Socialization is also important, as they may be wary of strangers. The Gordon Setter needs an actively involved owner, preferably someone who understands the setter mentality and enjoys grooming the dog. He is great with children who treat him well. He is usually good with other dogs but may not be good with smaller pets. Health concerns include bloat and hip dysplasia. Share your Gordon Setter story. Note: Upload only Gordon Setter picture or your picture with Gordon Setter below - spammer's ip may be blocked. The handsome, well-muscled Gordon Setter is the most alert, serious, and sensible of the setters, a graceful yet powerful dog who enjoys hiking, biking, jogging, and field work as regular exercise. Though usually calm and dignified, with a wise and noble expression, the Gordon Setter does have a silly side, and also a demanding side. Gordon Setters thrive on one-on-one attention, you see. They can be jealous of other pets and are sometimes aggressive toward strange dogs. The strong-mindedness of the Gordon Setter calls for early training by someone who knows how to establish and stick to rules, but you must be patient and persuasive, never harsh. Gordon Setters also have long memories: Once they learn something (whether right or wrong), they’ll remember it for a long time. On the negative side, this means bad habits can be difficult to break.